WHAT makes CCU a one stop company? 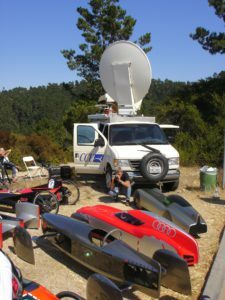 We supply the whole package when it comes to transmitting news, sports or corporate LIVE events. Our network credentialed platform and crews are widely respected in both national and international media circles for our reliability, affordability and passion for excellence. Central Coast Uplink provides the flexible platform, cameras, visual storytellers, lighting, audio-techs and production assistants to get your next project in the can without a hitch. We specialize in fast deployment, customer service and reliability. Our crews are provided via Randy Thieben Productions, which is a one-stop solution for getting fully equipped network experienced EFP/ENG crews on your next project. Whether you’re capturing a fast-breaking news story in downtown San Francisco or producing a corporate video in suburban Watsonville, CCU and partners can deliver an experienced crew who focus on creativity and customer service With over two decades of experience, plus state of the art equipment, CCU will meet the unique logistical and production challenges of breaking news and news magazine programming. Virtually every broadcast and cable network calls us regularly to handle their satellite uplink, production and editing services no matter what the assignments. 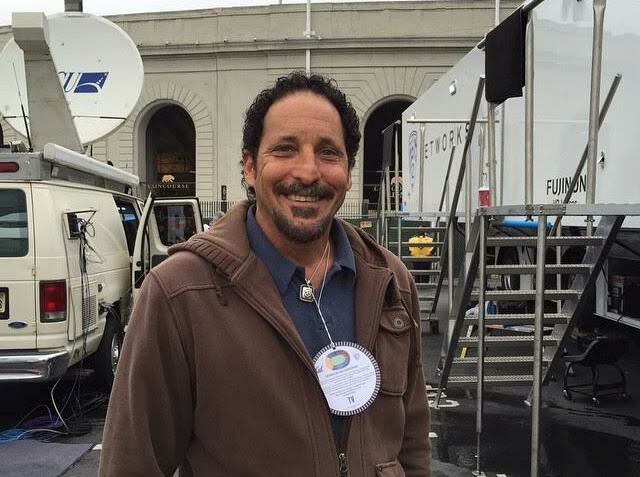 Our satellite uplink truck provided extensive hurricane coverage in New Orleans 2005, the Tookie Williams execution at San Quentin, jury selection of the Michael Jackson trial as well as the Los Angeles wild fires in 2006 and 2011, just to name a few. The CCU platform offers shared-access, low-contention IP satellite services designed for conventional IP office applications including thin-client, VPN and VoIP. IP backbone is routed through LBI-Sat in SLC where fully redundant, ATM capacity ensures that data is passed with speed and reliability. Ku satellite offers the most resilient commercially available Radio Frequency performance, with the platform designed to meet the rigorous demands of market sectors including Military and Broadcast. 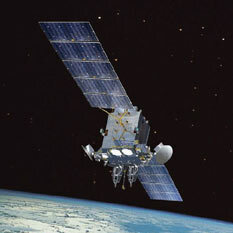 Offering unrivaled flexibility our satellite IP systems are a perfect solution for in-the-field IP applications. Based on compact and lightweight satellite technology our systems deploy in minutes in most any location, enabling content delivery and communications quickly and effectively wherever you need it. End-to-end delivery to a CDN network. Deliver live MPEG-4 video from locations where a traditional satellite uplink is not available or does not meet your budget. Mobile Broadband :Receive un-contended configurable broadband in remote places or locations where landline connectivity is not available or of poor quality. VNR’s are the television equivalent of the printed press release and is a vital component of any major public relations campaign. CCU and Video storytelling will coordinate your event and feed it via satellite or microwave to radio and television stations worldwide. It’s an emerging customer base that can offer an immediate and effective way for a variety of companies to deliver there unique message to a large audience. CCU’s partners will offer a turnkey video news release service package including audio/visual production and satellite broadcast. VNR’s are cost effective and many times preferred by many companies. 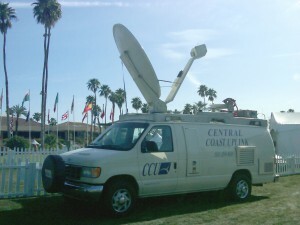 Multi-camera capability with frame syncs allows CCU to be a leader in providing the highest quality and most reliable satellite uplink services for regional and national sports as well as concerts and parades. NOW Offering special rates for post game interviews and tape feed packages. Call and book now and be the first in your market with highlights. CCU reaches millions of people via satellite transmission. Half of the American public, approximately 130 million people, look to television for all of their news. They do not read newspapers or news magazines. They are not reached through words, but through pictures, video footage and broadcast interviews. To reach this massive audience, many companies participate in Satellite Media Tours (SMTs) to deliver their messages in a timely, credible and cost-effective way. 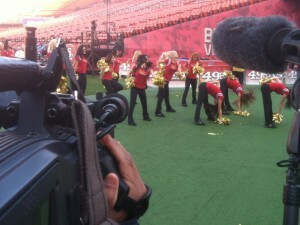 •Regular traveling media tours are expensive and time consuming. •SMTs can target stations in your key markets. •Unlike video news releases, station bookings let you know your results in advance. Instead of having your spokesperson spend days or weeks on the road meeting with target media face-to-face, all interviews can occur on one day from one studio locale. By making sure you have a timely, interesting subject to discuss, some in-studio visuals and/or B-roll footage, the SMT can reach a vast audience. Television and cable stations are informed about the SMT topic and spokesperson days before the SMT. They then reserve time to conduct an interview with the spokesperson via satellite. During the SMT, your spokesperson talks directly to television stations across the country about your products and services, and sometimes even gives demonstrations. Satellite Media Tours are growing in popularity as a cost-effective means for delivering live interviews to affiliates across the country. CCU offers the flexibility of production and uplink capabilities in the same satellite uplink truck, improving coordination and lowering costs. Corporate Teleconferencing: CCU also provides satellite uplink and downlink services for corporate, educational and medical video conferencing and video news releases. CCU is committed to providing turnkey service to our clients. As part of this commitment, CCU has created exclusive partnerships with a select number of preferred suppliers of occasional use KU satellite space segments. Thanks to these partnerships, CCU can provide extremely competitive rates on satellite space. 3,6,9 or 18 MHZ digital space on both full and half transponders can be procured in 15-minute increments with the added convenience of approximate window end-times to allow for flexibility in transmission services. 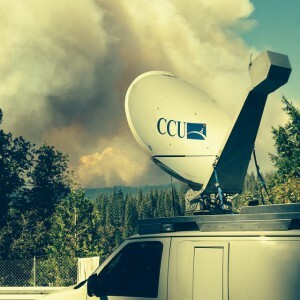 CCU has provided satellite space segments for events such as satellite media tours, corporate uplinks, sporting events, and breaking news. Call for a competitive quote for your next project. Need a ENG/EFP crew ? We have producers, directors, camera operators and sound technicians that can provide network quality HD or SD support for ANY assignment. Our crews are provided via Randy Thieben Productions, which is a one-stop solution for getting fully equipped network experienced EFP/ENG crews. This means you get the whole package and we handle the arrangements. Our network credentialed crews are widely respected by national and local news leaders for creative shooting, producing and editing. We assemble all that you need including: cameras, visual storytellers, lighting, audio-techs and production assistants. We specialize in fast deployment and you can’t beat the local crews in knowing the area.